When it comes to the high-end VR home market, both the Oculus Rift and the Playstation VR are aiming for the top spot in terms of unit sales and popularity. One is for the PC while the other is for the PS4 console. As to which would be the better buy, let’s check it out. If you would like to experience the best that Virtual reality currently has to offer and you can afford it just the same, high-end VR equipment is recommended because there is nothing that can compare with it. Mobile VR though cheaper and readily available can only give you a glimpse (though pretty much a good one) of what a VR experience is. Unfortunately, though probably acceptable, it won’t be as good enough as the high-end HMD’s can. There are currently only 3 commercial HMD models that cn give you the kind of quality worthy enough of a VR experience. One is a joint effort between the US and China (HTC Vive), the other is a US developed device (Oculus Rift) and the last comes from the land of the rising sun (PSVR). The Vive has the highest quality and the most costly of the 3, so unless you really really have a lot of cash to burn beyond the usual can afford it, let’s just skip it for now and focus our discussion on the two remaining contenders who seem to be going head to head with each other for the high-end VR market share. The Oculus Rift and the Playstation VR both have their own advantages and disadvantages when compared to each other. However, it is still up to the buyer who will use the equipment to make a choice which will depend not only on the qualities of the HMD’s but on the technical capability and interests of the person as well. Let’s see what each device has to offer. Usually, when you buy a device or a piece of appliance for the first time, you would normally ask the salesperson or read the product specifications of that which you want to buy before putting down your cash. Of course the same would go true for an expensive VR HMD. The PSVR uses RGB OLED (organic light emitting diodes) for display. Has a panel display of 5.7 inches with a resolution of 960 x 1080 per eye. It has a refresh rate (the rate at which the frame being displayed is re-drawn or updated) of 90hz and 120hz when in cinema mode. Frame rate however (that which shows the smoothness or jerkyness of the display when in motion inside VR) will range from around 60 to 90 and 120 FPS (frames per second) depending on the content developer and FOV (field of view) is around 100 Deg. The PSVR comes with an array of devices like the magnetometer, accelerometer, gyroscope and the PlayStation Eye tracking system. The PSVR uses both HDMI and USB ports for connections, comes with a pair of earphones and uses either the Playstation Move wands or Dual Shock 4 game pad controllers. In contrast, this is what the Oculus Rift has to offer. The Rift also uses OLED displays with a panel size of 3.6 inches per eye. Each has a resolution of 1080 x 1200 also with a refresh rate of 90hz, a FOV of 100Deg and frame rates that currently go as high as 90 FPS. The Oculus comes with an accelerometer, gyroscope, magnetometer and a external Constellation tracking camera. It uses an HDMI 1.3 output, two USB 3.0 ports and additional USB ports if you plan to add more cameras. The HMD comes with built-in headphones with 3D audio and a microphone. The rift uses either the Oculus Touch or the Xbox One controller pad. Ergonomically, both Oculus and Sony took extra care to bring out HMDs that though are not really that attractive, are both comfortable to use in their own way. The Rift is compact, comfortable, lightweight at around 470g, has reinforced straps and a smooth plastic body. The PSVR however seems to have a much more user friendly design that uses an ergonomically molded black and white plastic body that focuses the load on your forehead. The PSVR is sort of worn like a helmet or headgear and comfortable even for those who wear glasses. It’s a little heavier though at 610g but eliminates the need to wear the HMD like goggles the way the Oculus Rift does. Though not as compact, as far as ergonomics goes, the PSVR is a far better HMD. Performance wise, there have been some noticeable disparities between the two. 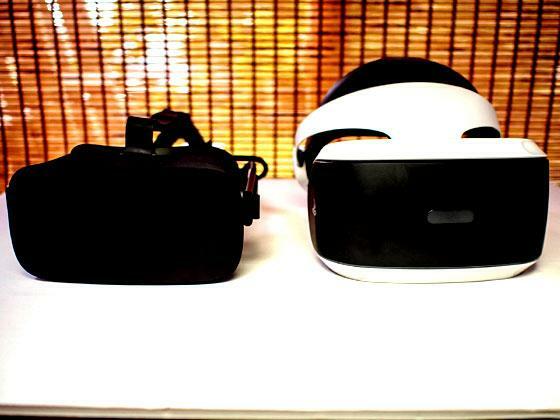 Though the Rift seems to be the one with more power with a slight advantage in specs, the PSVR is observed to have a much smoother performance and a more clear display. For one, the use of RGB sub-pixels minimizes the Screen Door Effect (black spaces seen between pixels). The screen is darker and unlike the Oculus, does not suffer from unwanted Crepuscular Rays when viewing dark environments. Both the PSVR and the Rift will need specific hardware to run. At this point, preference will depend largely on what sort of person the user is as well as the budgetary constraints involved. In layman’s terms, the PSVR is clearly the winner. First, it only needs the PS4 to connect to. It’s sort of simply plugging the HMD to the interface box and the box to the PS4. There may be a lot of cables going here and there but it’s basically plug-and-play and how hard can that be? The Rift on the other hand entails a set-up process that probably, only computer junkies would appreciate and enjoy. To simplify things, you will need a monster PC to begin with. Anything lower than an i5 4590 or equivalent is not recommended. Your GPU card should at least be a NVIDIA GTX 970 / AMD R9 290m or an equivalent or greater card. You’ll need around 8GB of Ram, 3x USB 3.0 ports plus 1x USB 2.0 port for input and a compatible HDMI 1.3 video output. Minimum OS would be Windows 7 SP1 (64 bit) and above. For the fun part, you’ll not just gonna take out the HMD from the box and plug-in all the cables, you will have to set it up and that means installing all the needed drivers, applications and all, then testing, troubleshooting then testing until you get it to run. Probably a piece of cake for the techs but most people would rather not go where no man has gone before, so the PSVR definitely wins. Ah, the controllers, both HMD’s can either use game pads or hand controllers. There’s really that much difference when it comes to the PS Dual Shock 4 or the Xbox One controller pad as you get used to the orientation of the controls as you use it. The difference though between the Sony Move Wands and the Oculus Touch controllers is more apparent. The Touch has a better tracking system compared to the wands and has a much more immersive and realistic feel. In this aspect, Oculus wins. If there’s one thing both of these contenders have in quantity, it would be content. The Oculus though has more as it was released ahead of the PSVR. Also, since the Rift is PC based, content can readily be downloaded online from several sources aside from Steam and the Oculus Store. The PSVR on the other hand has to rely on Sony’s in-house development and other accredited third party studios that though mostly awesome in quality, pales in terms of the quantity available for the Rift. It is an unfortunate fact that worldwide economy in terms of reality seems to grow smugger and smugger by the day. More and more people and even companies and government agencies have to operate under a practical budget. The common reasoning then boils down to cost and effectiveness. The Oculus Rift cost around 600USD. Add the Touch Controller, extra cameras, other peripherals and that monstrosity of a PC and the price shoots up to… well you get the drift. The PSVR cost around 400USD or a little more but comes with the canera, Interface box, Move Wands and software bundle. The PS4 console is currently priced at around 350-400 USD. Chances are, even if one can go through the process of setting up the Rift but simply wants to experience or play games in VR (and not be a developer), the extra effort and cost just doesn’t seem worth it. In closing, both the Oculus Rift and the PSVR can deliver high-quality VR experiences but most people nowadays tend to be practical when it comes to their spending. Also, we live in a time of instant everything where almost everyone wants to get things done without so much fuss. A plug-and-play PSVR looks like a much easier and cheaper way to get things done.